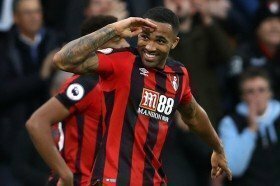 Chelsea are reportedly willing to make a tempting £50m offer for Bournemouth's Callum Wilson, should they fail in their pursuit of number one target Gonzalo Higuain. The Blues are on the search for a new marksman in the current transfer window with manager Maurizio Sarri recently highlighting the need to improve on the options in the final third. Amidst this, Higuain, who is currently on a season-long loan with AC Milan has been highlighted as the prime option, although a deal remains complicated with the Rossoneri having no intention of parting ways with the Juventus ace. According to Sky Sports News, the Blues are also considering alternative choices for the Argentina international and Bournemouth's Wilson is among the leading names on their radar. Cherries boss Eddie Howe has already suggested that the club may not entertain a mid-season sale of the striker but the Blues still appear keen on testing their resolve with a £50m offer this month.